I stood on the deck and stared at the rolling waves. I opened my arms for the air that came from far-far away. I cried when I saw the sky and the ocean merge as one. I glowed with the warmth of the beautiful sunrise. I let the strong winds caress my hair. I danced in the beauty of the monsoon rains. I basked in the glory of the moon and stars. I happily sailed on a majestic ship. Every day, I dressed in style. I strolled around the moving five-star luxury hotel. I danced at the atrium. I ate sumptuously. I toasted with my friends. I watched movies under the sky. I made friends with people from all over the world. And and….. I never missed noticing those opulent staircases where I posed like Kate Winslet (inspired by her character of Rose in Titanic). 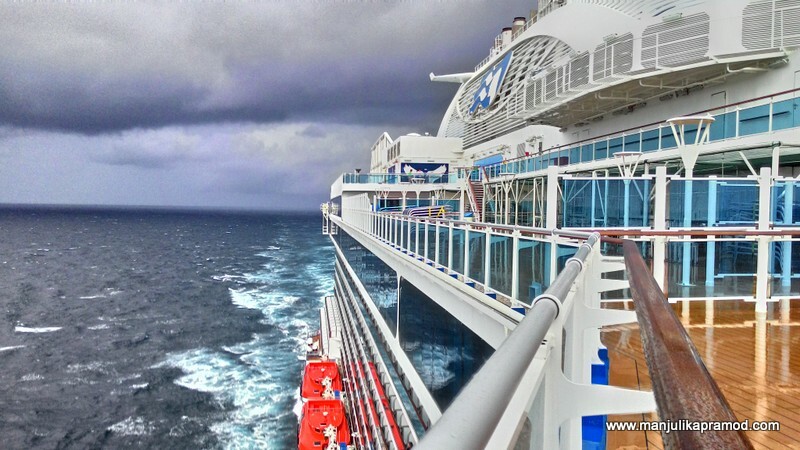 Cruising is a beautiful experience. You may have read about cruising, you may have seen pictures of the best, you may have heard from your friends but I bet you have no idea what awaits you inside these magnificent passenger ships until you have cruised yourself. 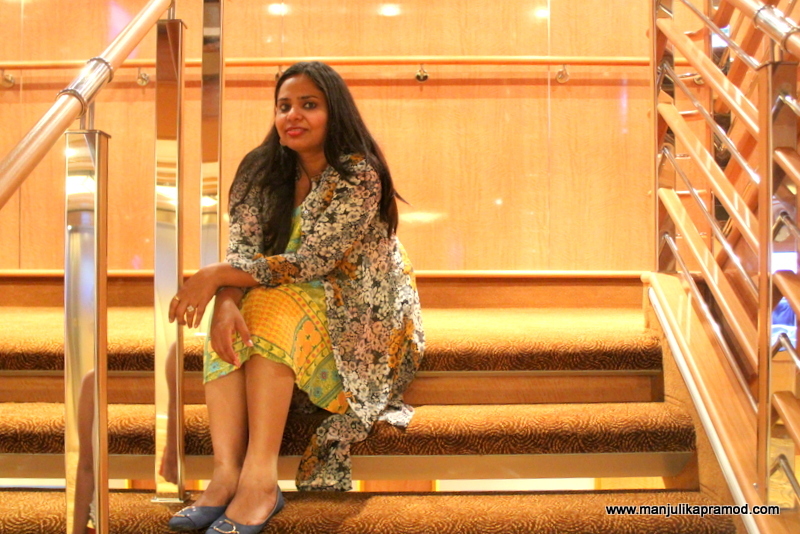 This was my first cruise, my first international cruise experience… and it will always be like an unforgettable love. 1083 feet in length and 224 feet in height, Majestic Princess truly lives up to its name. 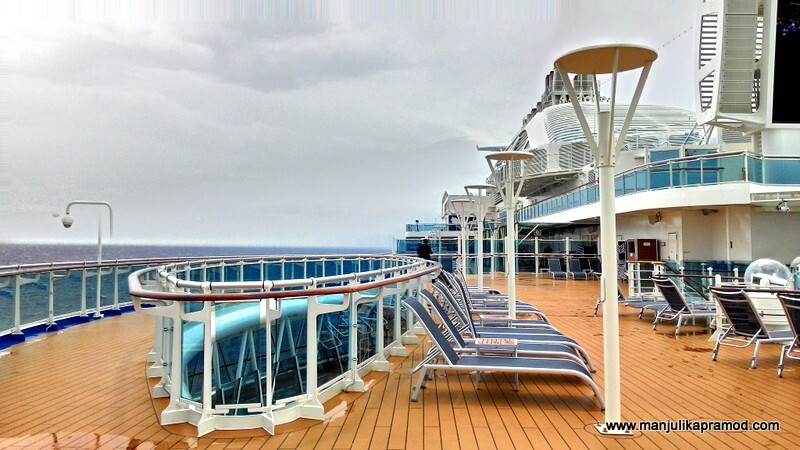 It is the newest sister ship to Royal Princess® and Regal Princess®. It has recently done its first inaugural journey on March 31, 2017. 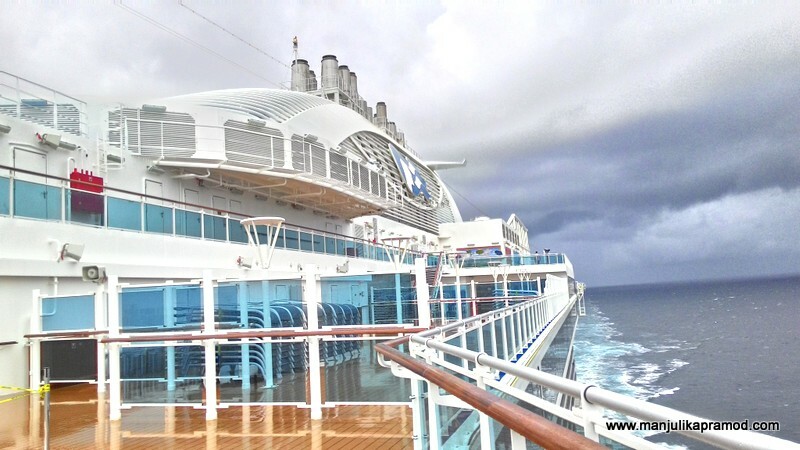 It is grand in its appearance and it exhibits grandeur in many of its facilities onboard. I was lucky enough to experience one of its shortest and sweetest routes – Dubai to Kochi via Abu Dhabi from 5th to 10th June. This was indeed special because it was a maiden route for the ship and we sailed non-stop for 3 consecutive days after we left the port of Abu Dhabi. Being a traveller, I have always known what the land holds for me but on the ocean, everything that came was all fresh, new and exciting. Dubai never fails to inspire me with its progressive vision. Every time, I am there, I love to explore what the Emirate is up to, but this time the agenda was entirely different. After a short trip to Dubai mall in the day, I headed to Port Rashid. The moment I was done with all the boarding formalities at the Dubai Cruise Terminal, I couldn’t contain my happiness. My friends were excited too. We are a crazy bunch of travellers and our pictures on Facebook will give you an idea. After grabbing our room cards, we were all eager to walk towards the ship. And trust me, the moment we saw ‘Majestic Princess’, up, close and personal, we all jumped with joy. It was so massive, so elegant, amazingly beautiful, resplendent in blue and white, welcoming and appealing from all directions. We looked like ants in front of it. I was immediately transported to my days in Norway (2012) when I used to sit at the Oslo Opera House and watch the cruise liners depart each day for their Copenhagen trips. I had booked a trip too but had to cancel later. So finally after a long wait, this was my first cruise. And I couldn’t wait…. I had a balcony room to myself and it was on twin sharing basis. I was putting up with a great friend of mine and we were very happy about being on the 10th deck. By the time, we reached our room, the baggage was already there and I must say the room was absolutely impressive. The view of the sea from our beds sent us in a daze. And far away, when the ball of fire dived into the ocean, moments of bliss came calling in our room every day. The fact that it was just the beginning and we were going to stay there for five days was already making us all heady with excitement. In fact, this is all that I would like to say about the first day because everything else that happened left us overwhelmed. It was only on the next day that we found back our feet and began exploring the various interesting corners of the ship. From the food to the restaurants, casino to the karaoke, services to the spa, ambience to the world class facilities, even five days were not enough. Each day was like opening a Pandora box. The whole experience was so thrilling. The word that can explain it best has to be ‘out of the world’. By the time I woke up on the second day, we were at the Abu Dhabi cruise terminal and two of my friends were gone for the Grand mosque visit already. I had been there before and thus I chose to stay on the ship and check out the port. The last thing I remembered from the night was that I had waved a goodbye to the Burj Khalifa from Deck 17 of Majestic Princess and hung around there till late night. To break the magical spell, I dressed up quick, filled myself with lots of food at one of the restaurants and walked around to check out some interesting activities around the atrium, which was the shiniest and glamorous section of the cruise inside the vessel. For the outdoor, nothing could beat the Deck 16 for its swimming pool, open-air theatre and sunbeds. In the next few days, we kept visiting these places again and again. As we got a hang of the place, the journey became all the more riveting. Sunny days on the sea!! For the next three days, we sailed and sailed. For many reasons, this happens to be the most memorable part of my journey. There was no distraction of visiting the ports and we had the Indian ocean for our company. 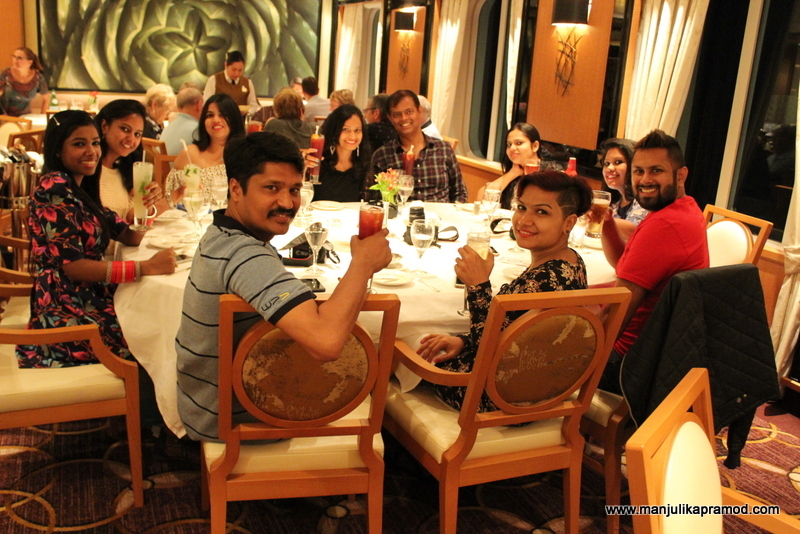 A number of exciting events, guided tours kept us engaged in the day while the dinners and cocktail parties made for our classy and sizzling nights. With all the adrenaline rush, I never missed a chance to watch a movie under the stars and tapping my foot at the Salsa sessions. And most importantly, I loved spending my time looking at the deep blue sea. Deck 7 was my place for escape and silence, both. And this is just the beginning of my experience. Keep following my posts for more…. Cruising with friends can be an amazing travel idea. 2. 19 massive decks to go around and find amazing stories at every step! 3. The most luxurious ambience and world-class settings. 14. Experiences like Movies Under the Star, Watercolour Fountain Show etc. 15. 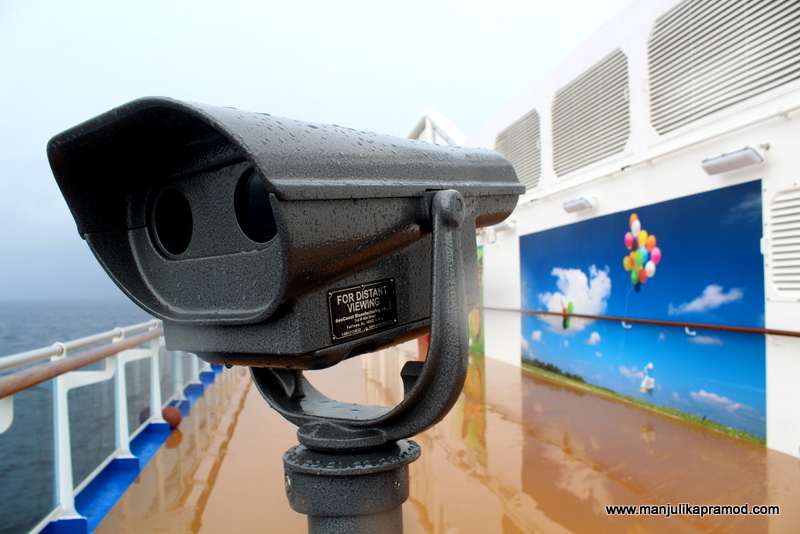 An amazing weather when we entered the Indian Ocean and the welcome monsoons that came from Kochi. Thank you @CruiseProfessionals for arranging an amazing trip! I have sailed with Princess a few times and they are very good. I love the friendly experience throughout the ship, it must have been fun taking the cruise with a few friends. One thing I love about the cruise is all the food, I just wish I could eat more, so many restaurants and so many options. Wow, 19 decks? That’s massive! I probably would’ve spent the whole trip exploring every part of the ship! 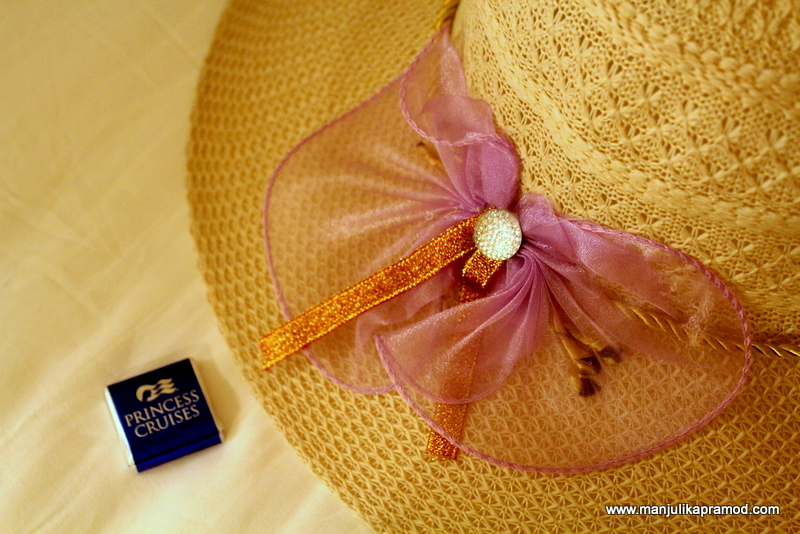 I would love to go on a Princess cruise one day, I’ve only heard good things about them. Everything about this makes me so excited about cruising. Movies under the stars, cocktail parties and of course – the food! Hoping to do our very first cruise this year! Can’t wait! Thats a wonderful write up. What was the total cost for travel? This looks like a great cruise and I am glad more and more cruses are happening in our part of the country. I have been to one in the Caribbean and it was a wonderful experience, so yes I can imagine all the eating and making the most of the ship. It’s really is a different type of relaxing vacation. What a beautiful ship and a fabulous experience! I haven’t been on a cruise (yet!) but I can’t wait to dress up each night, dance in the atrium and watch movies under the stars. It all sounds just wonderful! This looks like so much fun. I am going on my first cruise since childhood this year. I can’t wait! Looks like you had an amazing time! I’ve always wanted to try a cruise but afraid I would get bored. Maybe I need to reconsider my thoughts after reading how much fun you had.